Forgiveness is something that touches every decision of our lives. 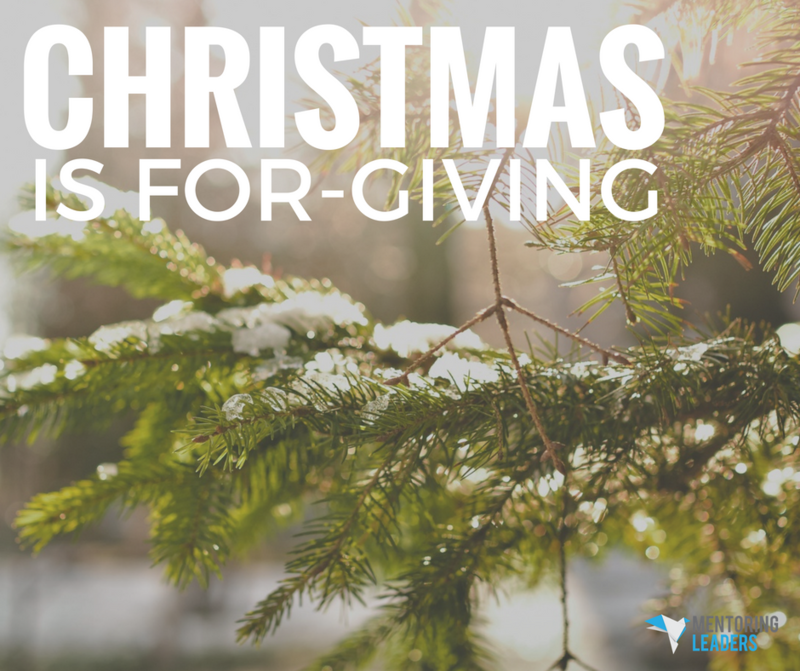 There is one characteristic about forgiveness that is often overlooked; but first, let us begin with a classic Christmas scripture. “She will bear a Son; and you shall call His name Jesus, for He will save His people from their sins” (Matt. 1:21). Jesus came for His people because we need to be delivered from the devastating effects of sin. He came not only for those outside the Father’s Kingdom, but for those who are inside the Father’s Kingdom who need to be delivered from the effects of sin. Though it is given, forgiveness really has huge benefits for us. However, forgiveness is something that we cannot give until we receive it. Forgiveness is unmerited, undeserved. The Lord gave us forgiveness. Even while we were yet sinners, Christ died for us. Forgiveness was given when we deserved it the least. He paid for it, purchased it, and made it available to us. He invites us to Calvary to receive that gift. We must receive it. “You were dead because of your sins … Then God made you alive with Christ, for he forgave all our sins. He canceled the record of the charges against us and took it away by nailing it to the cross” (Col. 2:13-14). The Lord annihilates or obliterates the record against us. This gift of forgiveness is huge. “Whenever you stand praying, forgive, if you have anything against anyone, so that your Father who is in heaven will also forgive you your transgressions” (Mark 11:25). To understand the importance of forgiveness, we first need to understand the silent, slow, deadly march of unresolved sin in our life. When there is an offense, when there is a betrayal, when there is a broken expectation and we hold something against someone else because of a sin, it sets in motion that unresolved sin. It sets in motion a progression that, if not arrested, will end in death. We are all human. We will all struggle, but Christmas begins with forgiveness. How can we get closer to this kind of amazing grace? Most of us have priorities, but do we prioritize them? Most of America does not. We live other than what we believe and we live inconsistent, incongruent lives. Priorities usually come to the surface when we are about ready to die or go into surgery. When you are going into surgery and you do not know if you are going to live or die, nothing matters at that point except GOD. Isn’t that right? What becomes priority is our relationship with God, our relationship with our family, our spouse, and our kin. Everything else does not matter at all. What is priority? It is the relationship that I have vertically with God and with those who God has put me with horizontally. Everything else is moot. Prioritize! It’s all about relationships. “… being diligent to preserve the unity of the Spirit in the bond of peace” (Eph. 4:3). “… if we walk in the Light as He Himself is in the Light, we have fellowship with one another, and the blood of Jesus His Son cleanses us from all sin” (1 John 1:7). Prioritize priorities and everything else takes its place. That is what Matthew 18 talks about. When a man would not forgive, he was the one thrown in prison. “And his lord, moved with anger, handed him over to the torturers until he should repay all that was owed him. My heavenly Father will also do the same to you, if each of you does not forgive his brother from your heart” (Matt. 18:34-35). Forgive for our own health. Medical doctors have done secular studies on forgiveness and health. They looked at patients who refused or could not forgive, where un-forgiveness was tolerated in their system. They found this resulted in an imbalance in their body chemistry and caused all kinds of neurological problems. In fact, they call this a neurological, homeostatic disequilibrium. They found when we have un-forgiveness in our life, it upsets the chemistry balance in our body. The hormones, endorphins or serotonin levels or different kinds of chemistries in our body go haywire. Our brain goes weird and what happens is we start having mood swings. We don’t know what’s happening because our chemistry is unbalanced and we can’t regulate it. The greatest gift we can give this Christmas is forgiveness. “But if you do not forgive others, then your Father will not forgive your transgressions” (Matt. 6:15). In following Christ’s example take a piece of paper and give a gift of forgiveness. Is there someone who you need to forgive, someone that you need to give forgiveness to? One of the greatest gifts to give this Christmas is forgiveness. It has huge benefits for you.